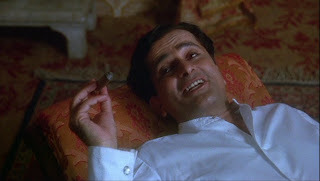 If Merchant, Ivory, and Jhabvala don't stop ripping out my dil and throwing it SPLAT onto the screen I'm going to have to stop watching their movies. And this time they messed with my head, too - and decked the whole tricky beast out in nawaby finery and 1920s party dresses. I ask you, what chance does a girl have? The narrative in Heat and Dust flips back and forth between present day and the last decades of the Raj, both in the same location in India. 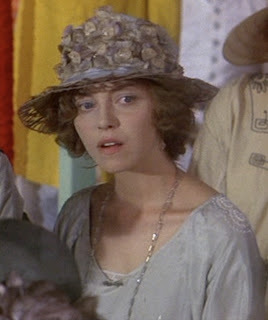 In the modern day, Anne (Julie Christie) has found letters written to her grandmother by her great-aunt Olivia (Greta Scacchi) about her life in India, beginning in the 1920s. When her husband, a lower-level official, is off working, Olivia gets to know the local community. and now, when it's Inder Lal's office. has sweet and toe-curling bookends in both her own story and Anne's. Anne's story is the easier one to make sense of: she's in India in search of something, and she's not entirely sure what when she starts out but seems to find her bliss or whatever by the end. In the 1920s, though, life is more complex, as life in movies seems to be when social norms prevent people from doing and saying what they really want. (The question of social norms comes up in Anne's story too; most of the major points in Olivia's life have parallels in Anne's.) All the characters want something, everybody has something ugly in them, something to color how you interpret them. Olivia is probably the least skewed, and she comes off more ignorant than anything else. Like young Lizzie Buckingham in Shakespeare-Wallah, naive Olivia has to navigate her attraction to a manifestation (and I do mean "man") of the more sophisticated and equally rule-bound Indian culture. I honestly don't think she's exoticizing the culture she finds herself in; at least, she's not exoticizing it any more than she has been kept at a distance and simplified by both the English and the Indians. The only person who really seems to be her equivalent and true friend is Harry, who's not Indian by any stretch but seems to have no use for or interest in the world of the English. Anyway. Motives. The Nawab is broke and grasping for cash, Olivia's husband worries about his job competency, the higher-up English officers do everything they can to minimize the threat of rebellion, and all of the women seem to obsess over what is and isn't done. At the same time, the characters' hidden agendas and run-ins with customs and boundaries lead to awkwardness that is funny to watch. Olivia has the most trouble, of course, but everyone at some points has to choose what to do with social expectations and obstacles. There are many conversations about how to behave and how to think about other people. 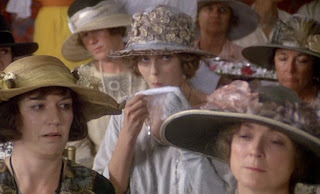 Upon first arriving in India, at a formal event Olivia is offered a snack she can't stomach and has to make desperate faces at her husband, who mimes to spit it out in her hanky. It's funny on a basic level - xenopobic, emotionally unstable memsaab spouts nonsense - but it's much juicier if you recognize the actor. As Bart Simpson would say, "The ironing is delicious!" 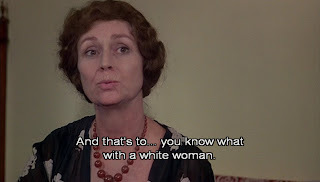 Lines like this - for example, Anne all but rolls her eyes while supposing contemporary English people move to India trailing after some guru or other - make me think that MIJ have a keen sense of humor about the stereotypes that float about in the sea of Indian-Anglo culture and relaitonships. It could be that they were also having fun with real life stories: in addition to the Kapoors' Indian-English love story, Julie Christie was born and raised in India. But does the sense of humor guarantee they're not falling into exoticizing, demeaning ideas and depictions? I really don't know. 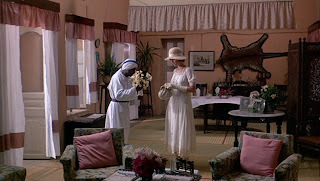 I know orientalism is a charge frequently levied at Merchant and Ivory, and I haven't found it to hold up in their other India-based movies I've seen. Yesterday The Horror!? and I were discussing the culpability of works that present something vile and also a voice that criticizes or laughs at or otherwise seems to minimize the vileness; in his words, "having it both ways is an old exploitationer [good word, right?] tactic." For example, what do we make of Shashi's unctuous prince? He loves the trappings of his status and the lifestyle he's had, but he has his hands full playing the Raj while agitating politically behind the scenes. Decadent, impotent dandy or clever independent? Or Anne's host family, who tries to cure daughter-in-law Ritu's unexplained illness with chickens, fire, and a pilgrimage to a holy site. This little arc was the most troubling to me because it's presented with no information. We don't know what's wrong with Ritu, who screams and thrashes at night but seems perfectly lovely and competent during the day, and we don't know what the bowl of fire and waving a chicken over her are supposed to do; we only hear that Anne tries to take her to a specialist doctor and Inder Lal declines. Stereotypes abound, mostly racist British officers, but I thought they were pretty clearly being criticized and poked fun at. Most of the language they use is so appalling and unsubtle that it's hard to believe the filmmakers would have them use it for anything other than easy targets. You could probalby argue they're too broad to be effective skewers, but I don't think they make sense as anything else. The Nawab's mother (Madhur Jaffrey) is another hater; she loves viewing the pomp of the English and making the ladies squirm by her pointed quesitons or shunning them altogether. Both Indian and English characters in Heat and Dust present a variety of opinions about the Raj and about each other. Everyone in this movie has prejudices, some nastier, more ignorant, or more harmful than others. Now that I've finished all that description, I'm not sure what the movie is about, really. It was emotional and biting while it was going, but I'm not left with any strong feelings or impressions - I was really choked up at parts, mostly those that moved at the personal level of responding to one's attachments and attractions (hence the heart-splatting, but I don't want to tell you what they are so I won't spoil the movie - just know that it tugged some strings), but I recovered immediately, unlike with the devastating Shakespeare-Wallah. I think Heat and Dust is basically about the importance of finding what/where/who makes you happy and doing/going to/being with it/them - and, it must be said, there is at least one character who embodies the potential troubles that can accompany such decisions if you buck the social norms too dramatically. I'd love to hear from someone who has read Jhabvala's Booker Prize-winning novel, which I can easily imagine has more going on and/or focuses on different aspects of the stories to create a different message overall. * I definitely got a vibe between Harry and the Nawab. Can anyone who's read the book to speak to this? Ahh, this is perhaps the only MerchIv film that I've been very keen to see - maybe because it's an explicit look at colonialism from some accused Orientalists. Let's not beat around the bush, eh! Hanging out with the Nawab instead of the other memsaabs? Understandable. I love 80s Shashi, he's the new Radiohead. I saw this one years ago and my memory is a bit vague as the movie didnt make a positive impact. Remember thinking that the Olivia arc of the film is quite interesting inspite of the nawab's visible triumph at having sired a baby with a 'white' woman. The modern part of the story however, struck me as quite inexplicable - doesnt Anne go to a practitioner of traditional medicine to have an abortion in the same way that her great aunt did? Why? Do not remember the chicken-cure part but that sounds straight out of rural, uneducated, or 20s educated, urban India and not typical of an educated family in 80s urban India. In all their Indian movies I've seen so far, I think MerchIv struck the right notes only in Shakespeare Wallah and to some extent in The Householder (have yet to see In Custody). I should probably re-watch this before making up my mind to dislike it but watching most of their movies is too much like hard-work (inspite of Shashi)! I saw this a loooooong time ago. I have the book on my bookshelf, and the movie (VHS) in my collection. I don't really want to see it again, because it was a little wrenching. 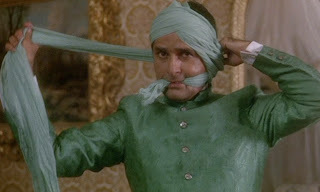 And Shashi's character just seemed self-absorbed/weak/opportunistic but with his natural sweetness coming through. In those scenes with Harry, I really got a sense of affection. Not sure if it was acted on by either party, but I wonder if there were shades of Merchant-Ivory's own story going on there? The wife Ritu has epilepsy. Which is why you will see her family trying to restrain her by putting something in her mouth (I think it was either some keys or a pencil, I can't recall). Many myths swirl epilepsy in India, most common of them being that if you give metal keys or iron rods to a person having a seizure, they will be cured. Not so prevalent now, but would certainly have been at the time the movie is set in. Why have I never seen this movie? I'm usually a total panting fangirl for MI stuff. Hmmm. I saw it a long time ago as well, and while I wasnt convinced by Zakir's character, I thought he was amazingly cute! 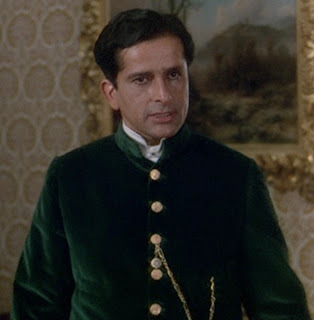 And Shashi was SUCH a revelation as a somewaht dissipated ruler- I swear that man isnt appreciated enough. ppcc - If you don't watch Shakespeare-Wallah soon I'm going to come over there and make you. re: orientalism: I'm still no the "no" side, but I haven't seen all the relevant evidence yet. The other memsaabs are horrid. If I were Olivia, I'd rather hang out with pretty much anyone else. Side question: can one exoticize/oreintalize one's own culture, which is what we're talking about with Merchant? Discuss. My vote is "probably." 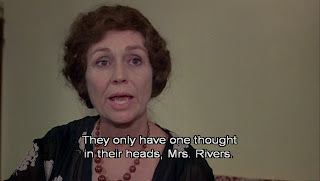 Bollyviewer - Olive is the more interesting arc, I agree. Whether or not her child is the Nawab's is not stated clearly in the film, though the Nawab certainly thinks so and acts as though it is. And quite possibly the fate of their relationship would have been a lot different it he hadn't. And yes, Anne does do that - and I'm not sure why. 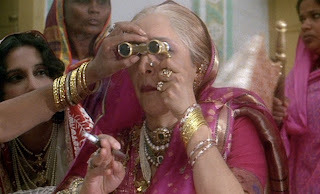 bombaygirl - I agreek, it had some wrenching moments. You've describe Shashi's character well - it's hard to know what to make of the Nawab, because he seems like a decent enough guy but is clearly up to some fairly dangerous machinations too. (The movie usually refers to these rather than shows them directly, so we don't see much of the impact of his misdeeds.) He's also wistful and sad about his interpersonal mistakes, which makes him sympathetic. Good call on Harry-Nawab possibly reflecting Marchant-Ivory! Interesting question about Ritu. If the movie showed us anything about her sexuality, I missed it. Shweta - Zakir's character is cute, and I agree that his attraction to Anne is not explained well. Or maybe I'm just too dense to pick up on a subtle framing of it? Ditto re: Shashi! He really isn't. See Sanket's post on this very topic. I love this movie! It's like a Raj soap. 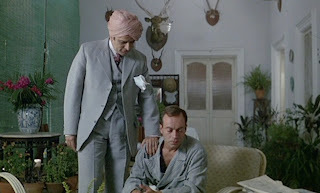 I haven't read the novel so I don't know if there's a gay subtext in it but in the movie there definitely seemed to be an implication that the Nawab was an equal opportunity sort of guy. Although it just might have been male bonding circa 1920s coz God knows I see subtext where none is intended in ye olden days. As for Zakir - he shouldn't quit his day job. Some of the confusion/lack of depth about Inder Lal stems from the lack of detail carried over from the 1975 Booker Prize winning novel into the screenplay. IMHO, there is lot of stuff borrowed from Ruth's own Indian husband that goes into Inder's character in the book. My lasting impressions are that this was easily my fav MerchIv production, with so many layers and the play on "contrasts": Hot and cold, rich and poor (the old beggar woman lying on the street) and the magnificent cinematography. Lastly, I would also posit that Jhabvala has made the inference (correct or not) that the social successor of the Nawab is the middle-class Indian male, which is why they are depicted in that urbane fashion. I had read this in school long back, but I picked up a copy at the liby a year or so ago. 1. (pertains to yr question): No similarity between Harry of the book (described as "fat and unattractive." I did a double take when I saw Nickolas.) So the "vibe" you saw was purely the players reading more into their screenplay. 2. the opening of the movie is very confusing for those who haven't read the book, in terms of the narrative structure. for folks like my wife who has hardly any time to watch ONE movie through, let alone rewatch it, this is a minus point. 3. Marcia, who plays a very important role in Olivia's life in the novel is barely/not at all mentioned in the film. 4. Maji is a very important and mysterious character in the book, while the relationship in the film between Maji and the narrator is glossed over and Maji is a very trivial background character. In fact, come to think of it, in the film, it’s mentioned that the narrator went to see her because she’s a midwife after she got to know that she’s pregnant on her own. This TOTALLY doesn’t fit with the description in the novel. 4. 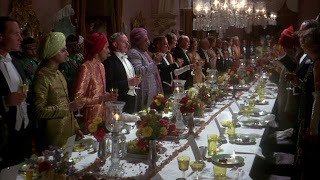 One of the most important facets of the book's narrative (and I know it's hard to bring this out in film, but "lesser" folks like Attenborough have succeeded in this effort) is Jhabvala's beautifully subtle description of the give/take, yin/yang relationship between the colonist and the colonized. In my mind, this was pivotal in making the entire narrative arc work in the book, but it doesn't come through in the film.